Het is alweer even geleden, maar voor mijn vakantie heb ik de mogelijkheid gehad om in samenwerking met Margit een team coachingsessie te organiseren voor mijn eigen team. Omdat ik zelf onderdeel van dit team ben, heb ik ervoor gekozen Margit te vragen een 2e onbekende coach uit te nodigen. Zo kon ik zelf deelnemen aan de oefeningen. Het blijft toch gaaf om te ervaren dat de patronen die ik tegen kom op de werkvloer meteen zichtbaar werden bij de paarden. Na terugkomst op kantoor heeft een van mijn collega’s een stukje geschreven over hoe zij de dag heeft ervaren. Dit wil ik jullie niet ontnemen! It was unlike any other offsite I have attend. There was no corporate meeting room with flat-screen tv or white board with markers nor was there fancy catering serving hot coffee and tea. This time it was outdoor and closer to nature, at a at typical Dutch farm somewhere in the country side at Waverveen. The weather on that day was classic Dutch too, the wind was strong and the sky was dull grey with light rain. We started the day with a hot cup of coffee sitting in the middle of the horse stable and a briefing by Rianne on the ‘Program of the day’ that she had carefully put together for us. 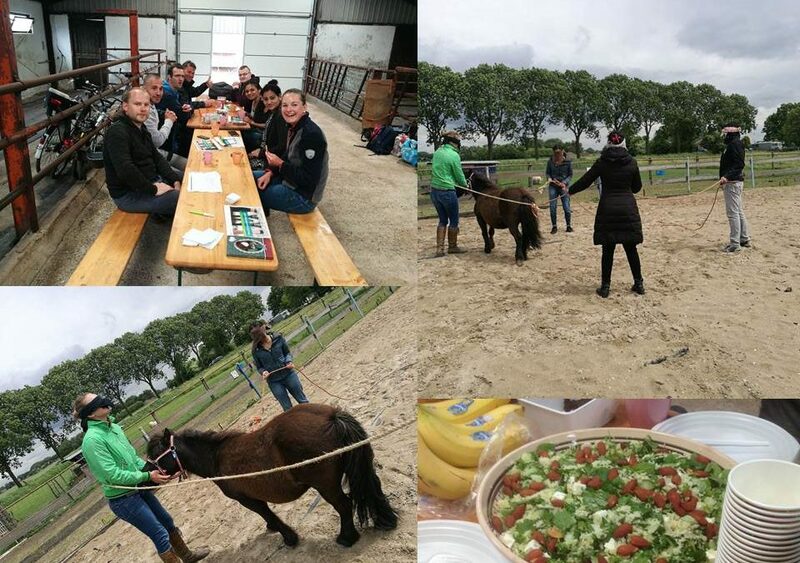 Then we started with a quick walkthrough on the “Equine Assisted Team Coaching” by Margit Sleeuwenhoek, after which we walked into the open field to meet the beautiful horses Adje and Ego. Our first activity of the day: Each of us were given a task involving the horses and we were asked to complete the task without talking to anyone. It was challenging in the beginning to break the ice and approach the horses. But slowly each of us found a way to communicate with the horses and do our task. It was very interesting to see how some of us (silently) played a supporting/leading role in helping others to do their task while some of us went solo and complete it independently. It reflected on the overall personality of our team. We ended the activity by spending time reflecting on how the experience was and what could have gone better. One of the main highlights of the day was the second activity we did with the horses. This time our team dynamics and mutual trust was put at test. We were divided into two teams of 4 each. Each team had to achieve the same goal: We had to bring the horse to the center and form a square around it using a rope, with each member at the corner. But wait, there was a catch – It had to be done blindfolded and the team to finish fastest wins! The entire 15 min was an experience in itself, starting with fear, doubt, then moved to planning and mutual trust and finally to the triumph of completing the impossible task all blindfolded. Not to forget the funny scene of chasing the horse, which was a good laugh for all the onlookers. We also got to feed the horses with some fresh carrots before we said good bye to them. This was a very unique experience as we got to see the other side of our team dynamics and cooperation along with horses which made it all the more fun and exciting!